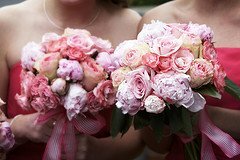 Pink wedding flowers are a very popular choice, especially in the spring and summer months. They are bright, cheerful and look great as bouquets, centerpieces and other reception decorations. 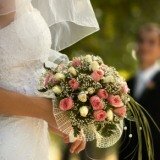 A popular option for brides is bouquets consisting just of roses. This is a beautiful option of course, however you don't have to limit yourself to just one color or just to roses. Pink flowers go very well with white, pale yellow, purple flowers as well as green accent flowers. They can be used in all aspects of your wedding day, from your wedding ceremony to all aspects of your wedding reception. Carnations are very versatile flowers that can be used in your bouquets, centerpieces and corsages. 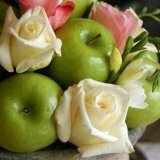 They are great compliments to other wedding flowers, and they come in many different colors in addition to pink. Used properly, daisies can make a stunning impression. There are many different varieties in addition to solid pink, so work with a florist to come up with a unique combination for your wedding. Peonies are a beautiful, popular option. They work great for spring and summer weddings by themselves in bouquets or paired up with complimentary flowers. A beautiful option for summer weddings, hydrangea work very well in combination with other flowers for centerpieces. They are a fun, colorful option that your guests will love. What wedding would be complete without roses? Pink roses are stunning by themselves or with other light colored flowers.